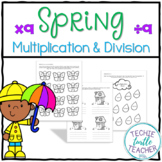 These are practice sheets that can be used for informal assessments as well. They cover all multiplication facts to the tens. There are 2 sheets that review all facts and there is also an individual sheet for each fact. These can be used in many ways. 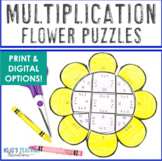 Practice basic multiplication with these cute multiplication flower wheels. 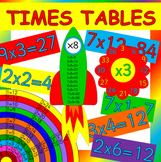 You could use these also as classroom decor to add color on your math corner. This resource is a 12 card set to teach multiplication or skip counting. 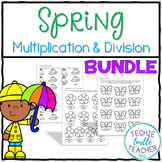 Fun and educational.